Girls in white dresses with blue satin sashes, snowflakes that stay on my nose and eyelashes. Silver white winters that melt into springs, these are a few of my favourite things. 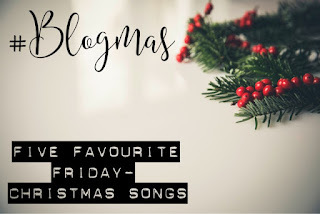 Aaand talking of favourite things, it’s my turn to pick the topic this week and I’m jumping straight into the Christmas theme with Christmas songs! This has to be my favourite thing about Christmas. I always feel so Christmassy when Christmas songs start playing on the radio so I thought we’d kick off the Christmas Five Favourite Fridays with the music side of things! There are no restrictions, it’s just the songs that are a must on your Christmas playlist! 5. In Dulce Jubilo – Mike Oldfield. Ok, so this one doesn’t have any lyrics, meaning there’s no belting it out in the car or the shower. But, it always makes me feel super festive and I just love it! 4. Step Into Christmas – Elton John. I can’t help but sing this one super loud whenever I hear it! And it’s always my first song of choice to lisen and sing along to while putting up my decorations! 3. Wrapped In Red / Underneath the Tree – Kelly Clarkson. I couldn’t choose between the two!!! I love both of these and although they’re not ‘classics’ they are always in my Christmas playlist and I can’t go through Christmas without listening to them! 2. Fairytale of New York – The Pogues. Because is it really even Christmas if you don’t listen to this one? 1. Santa Claus is Coming to Town – Jackson 5/Michael Buble. I love both the Jackson 5 and Michael Buble versions but if I had to pick my favourite of the 2 it would be Buble’s version. And that’s it! This was super difficult as I really just wanted to put my entire Christmas Playlist up here, but who knows, maybe that’ll appear in a later post during #Blogmas….